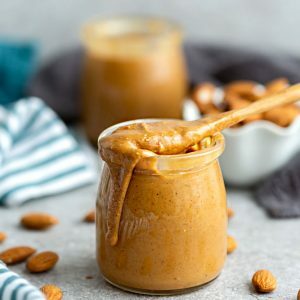 Learn how make homemade almond butter with this easy recipe. Delicious homemade almond butter using your food processor or high speed Vitamix blender. It comes together quickly and makes a yummy snack alternative to peanut butter. If toasting the almonds, preheat oven to 325 F and spread a single layer of nuts on a large-rimmed baking sheet. Toast for 10-15 minutes, mixing half-way. Remove from oven and allow to cool for 15 minutes, until no longer hot (warm is okay). Transfer the nuts to a high-powered blender like a Vitamix (fitted with the four-blade attachment) or a food processor. Process on high speed until smooth and creamy, scraping down the sides of the bowl frequently. Depending on the type of nut and your machine, this may take anywhere from 5-15 minutes. Be patient and continue to blend and scrape down the sides, the mixture will come together after the dry paste forms. You can add a bit of oil to help the process or depending on the consistency desired. If the mixture gets too hot, you can pause for about 5-10 minutes and resume again. Once the mixture is creamy, you can add any desired salt, sweetener or add-ins of your choice. Allow to cool down slightly before to a glass jar. Seal and store in the refrigerator for up to 3 to 4 weeks.